← The Rhythm’s Going to Get You. The Art of the Luncheon. It’s Tuesday. Why don’t you have lunch at the museum? When we are in Washington, D.C., Mrs. E. and I enjoy visiting the National Gallery of Art for an exhibit and luncheon in the Garden Café on the ground floor of the West building. The menu is always tied to the featured exhibit. During concert season, they serve coffee and desserts instead of the full menu. This month, brings us delicacies like Tataki Mashawa (seared tuna and bean salad) and Kebab Degi (lamb chops with onion, and mint in celebration of the Afghan Gold exhibit. It may be a bit pricey, but the atmosphere can’t be beat with the ficus trees, marble and art so nearby. What’s that you say? You can’t possibly get to a museum, eat and get back to your desk in the time you have alloted for lunch? Close your door, or get away somewhere quiet and take a virtual exhibit tour or download their video podcasts via iTunes to watch later, while you brown bag it. This entry was posted in Cultivating, Elegantology and tagged elegant lunch, museum, Richmond, trips, Washington D.C.. Bookmark the permalink. 18 Responses to The Art of the Luncheon. Great idea for a weekday lunch! The Mrs. and I frequent the High Museum of Art here in Atlanta on the weekends and, since the expansion and the addition of Table 1280 (http://www.table1280.com/content/home.asp), the visits have grown quite a bit longer and more pleasant. It’s a great place to grab a glass of wine before or after visiting the exhibits. It’s also the ideal spot to wait for friends before you head in. Right now the last of the Louvre series are on exhibit, so if you’re in Atlanta and haven’t made any of them yet now’s the time. Also highly recommend the cafe at the courtyard at the Art Institute of Chicago. Two such spots between home and school. One at our gallery, and one at the modern art – both offer an oasis in a hectic day. I heartily agree; I’ve had some very enjoyable museum dining experiences, and not always in the most expected places! My most memorable was having a lunch date with my husband in the Garden restaurant at the Art Institute of Chicago, but I’ve also had pleasant experiences at the National Gallery, the Toledo Museum of Art, and the Carnegie Science Center in Pittsburgh. Alas, the best museum-luncheon spot I know is the Trustees Dining Room at the Metropolitan Museum of Art. And since I’m not a trustee, I’ve only been there twice! Does getting caught in a rainstorm and ducking in for a 4 o’clock rendez-vous with your husband and children to dry each other off (due to Umbrella malfunction) while waiting for coffee and Ice cream in the Musee D’Orsay count?Not exactly lunch but still a “stolen moment, an elegant memory!” One of my favorite Museum spots and yes, they do serve a virtual lunch. Thanks for stopping by today. Any blog with Cary Grant in the left hand corner has got to be a marvelous place to visit! And, it is! Edward and i shall return. How grand! I’ve always wanted to be a lady who lunches! Wonderful idea. And I can attest for the virtual tour idea, it can truly provide a refreshing break. However, at this point, I’m in need of a proper lunch away from work. In New York, Lady Mendel’s Tea Salon on Irving Place, or the tea room at Takashimaya on Fifth Avenue, are perfect spots. Inspired post. I love dining among the trees at the High’s relatively new outdoor cafe — when it’s not so humid. But your resourceful idea to brown bag it and take a gallery tour via iTunes is just great. Oh and i’m in love with those white slipcovered chairs with what appears to be red piping! The recently re-opened and perhaps my favorite museum in DC is the National Portrait Gallery. It has a great open balcony cafe on it’s second level. Its a wonderful spot to have a glass of wine while the kids are across the street at the Spy Museum. Although I haven’t been to London since the late ’90s I have a wonderful memory of the dining room at the Tate with those fabulous Rex Whistler murals. I recall the wine list was impressive as well. I know that both the Met in New York and the Art Institute in Chicago have evenings when you can enjoy music in the galleries with cocktails. Wonderful experiences. Thank you all! What a very cultured and elegant readership I have. Your suggestions are most welcome and I am very much looking forward to reading the article that Aesthete mentions. Music in the galleries with cocktails sounds like heaven on earth. Oh, you just brought back some memories. 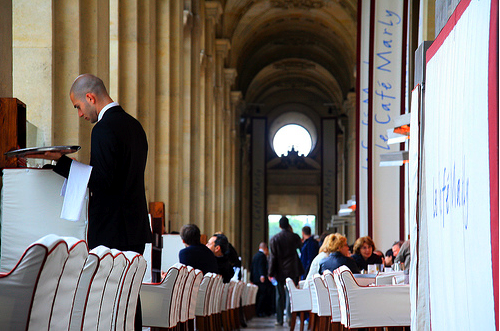 A few years back, my wife and I had a long lunch at Cafe’ Marley, overlooking the Louvre’s glass pyramid. It was wonderful and an absolutely classic Parisian experience (in a good way). We lunched with a very good friend, and Austrian, who made sure the waiter understood he was dealing with locals who were quite fluent in French. But it didn’t matter; he was a professional – and a nice guy – and we all had a great afternoon repast before delving into the museum to check out the Mona Lisa’s new gallery. editorial – sorry, I added an “e” to Marly! Next time in DC, try lunching at the American Indian Museum on the mall – one of the best restaurants in town for a cafeteria. Or grab a sandwich at the Portrait Gallery / American Art Museum (in the same building), which was recently restored and reopened.